This years Fire Season, beginning August 15th, at InanItah will be a Season of Selflessness! A season of sharing form the abundance of our hearts, our minds and and our privilege. Join us as a volunteer! The Fire Season will be open and we plan to continue our regular transformational programming including opportunities to join us as a visitor, volunteer and to join us for one of our upcoming workshops while we also engage in initiatives to support our neighbors. We suggest that you travel to us via Costa Rica. We are happy to help you arrange transportation. If you’d like to support before the Fire Season begins in August you have a few choices. 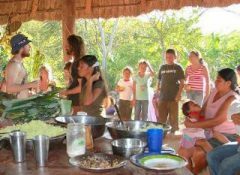 Contact Gaia Ma about volunteer opportunities both in Ometepe and from abroad. (Spanish Speakers are most helpful). Tell your friends who might be interested to volunteer. Donate to or share about our Hunger Relief Program.